I want you to take a moment and reflect. Turn down the television or music–clear your mind. Think back to when you got your first love letter. Do you remember whom it was from? Do you remember what it was written on and what color the ink was? How was it folded? How did it wind up in your hands? Was it shoved in your desk when you weren’t looking; placed into your palm as you passed in the hallway? Most importantly, how did it make you feel when you read it? Did your heart jump? My mind then wandered back to St. Mary’s in Mt. Clemens, Michigan. I was in the fifth grade when I got my first love letter. I don’t remember how it was folded, but it was ripped out of a three-ring, lined notebook. I wouldn’t dare divulge who it was from because it’s a small world. But I do have to say that despite the crazy misspellings and our total lack of understanding of what “love” meant–it rocked my world. A hand-written letter is becoming a lost art in our e-universe. This weekend, I’m going to try and free up some time to write how I truly feel to the person who has blessed me so much by coming into my life. Make sure it is from the heart. Don’t ever steal someone elses words! It comes across as artificial as a hostess cupcake (a real downer is “How do I love thee, let me count the ways.”) Writing should be an extension of how you talk, and “how you talk” is one of the things that made your honey fall in love with you. You’ve fallen in love because of places you’ve been together. Call out some of these places you’ve been to or experiences you’ve had. Talk about details of a certain trip (remember that amazing room in Vegas last year). You can also write about what may have happened in that room. Ha! The bonding of shared experiences make for great letter writing. I’m a huge believer in finding a Stationary Shop that you love. Beautiful paper makes the letter a work of art. I have a woman I go to for everything, (invitations, stationary, thank you cards). Her name is Shara, at Shara’s Paperie. 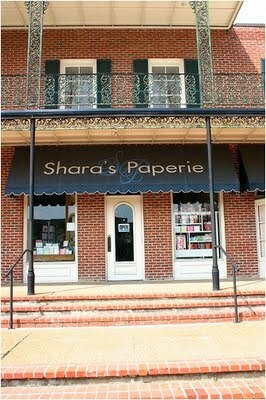 She just started a web site so people can get her creations nationally: www.sharaspaperie.com. Okay, so you have this beautiful, well-written, personal, from-the-heart letter. How do you give it to your man? Well, why not play hide-and-seek? Maybe place somewhere in the lacy bra and then make him find it! I’m just saying…. Here’s to much love and excitement on Valentine’s Day! And as always… keep counting! Your idea about writing a love letter is great. We have been married for almost 36 years and sometimes you think "Oh he knows I love him, why do I need to buy a card or a present?" But that is the whole idea–he is still special and he is your valentine and you do need to make the effort to let him know that he is still your favorite guy. So writing a love letter like we used to years ago would be really special. Thanks for the tip. How simple, sweet, uncomplicated and yet unique. I love this idea and your memory of how your first love letter made you feel so special was also sweet. What a special reason to want to make someone else feel the same way. As my youngest daughter would say OMJJ (translation-Oh My Joe Jonas)! I love this idea. Stationary, letterpress in particular, is my favorite way to express sentiment to my sweetie. He too has an appreciation for nice paper/handmade cards, so he really appreciates the time, effort, and creativity coming from the heart. I think I will try this on a non-holiday to spice things up!! Seriously Chelsea, this post was brilliant! 🙂 It feel like taking out my craft supplies right now and making my love a beautiful gift of words from the heart. Thanks Chels!